Spray valves dispense a close tolerance spray of low viscosity materials in order to produce an even coating over a surface area. 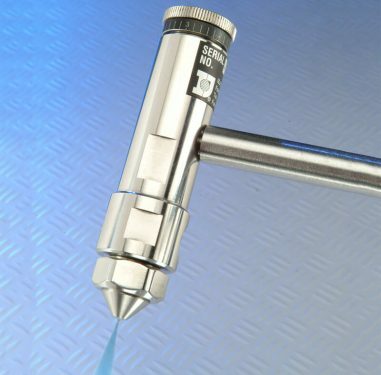 The preeflow eco-SPRAY spray dispensing system combines the reliable preeflow endless piston principle with a low-flow spray chamber, resulting in highly accurate spraying of low to high viscosity fluids with high edge definition. The Fisnar SV1000SS stainless steel spray valve provides close tolerance spray dispensing of fluids of up to 1000 cps. The SV1000SS is constructed of stainless steel to prevent corrosion from volatile materials. With a spray angle of 12° and an operating frequency of 200 cycles/min, the SV1000SS is designed for spraying flux, polyurethane, paint, lubricants, inks and for coating and conformal coating applications.